Intravenous (IV) therapy is a safe and fast-acting treatment that delivers vitamins, minerals, and other vital nutrients directly into the bloodstream. Its applications are far-reaching, helping support both people who experience chronic illness and who wish to maintain their overall health and wellness. Whether you want to prep for cold and flu season, combat dreadful seasonal allergies, or address an underlying health concern sacrificing your wellbeing, an IV infusion can be tailored to your unique needs. So what are you waiting for? Recover, rehydrate and renew your health with IV therapy at BNG Aesthetics Skin & Laser Center! To schedule an appointment at our Williamsport clinic, contact us today! Call (570) 748-6445 or contact us online. IV therapy can also support improved sleep, better skin, faster healing, and can work to prevent or shorten the duration of illness. Unlike vitamin capsules or tablets, IV therapy bypasses barriers, such as the gastrointestinal (GI) tract, which can interfere with nutrient absorption in the body. This is especially important for individuals with compromised intestinal absorption, including those with Crohn’s disease, ulcerative colitis, leaky gut, or IBS. IV therapy is completed in the comfort of our office and takes no more than 90 minutes. A member of the BNG Aesthetics team will insert a needle into a vein in the arm. A catheter is then pushed over the needle while the needle is removed. The chosen cocktail or drip is then delivered via controlled release into the catheter and then to your bloodstream. You may experience a mild burning sensation at the injection site; however, pain is minimal. Each BNG Aesthetics Skin & Laser Center IV infusion contains a potent blend of vitamins, minerals, or other fundamental nutrients required for optimal wellness. The precise contents of IV Therapy cocktails and drips are individualized based upon the goals of your treatment. Join our VIP Rewards membership to receive exclusive pricing on our extensive list of infusions available at our Williamsport clinic. Perhaps the most well-known IV Therapy solution in use today, the Myers’ Cocktail is named after the Johns Hopkins physician who famously used intravenous vitamins to enhance his patients’ immune function and to treat chronic issues such as fatigue, fibromyalgia, allergies, and asthma. Our Myers’ cocktail includes a potent combination of vitamin B, vitamin C, magnesium, and calcium that boosts energy and immunity to promote overall health and wellness. Enhance your body’s defenses with a unique blend of immune-supporting nutrients, including vitamin C super B complex, calcium gluconate, magnesium, selenium, and taurine. The Super Immunity Cocktail works to fight infection, shorten the duration of illnesses and is ideal for individuals with compromised or weakened immune systems. Are you experiencing energy slumps in the middle of the day? Does the stress in your life deplete your liveliness? The BNG Aesthetics Skin & Laser Center Energy Drip works to boost your energy, performance, and focus, and can also help to combat adrenal fatigue. It delivers an energy-packed punch of vitamins B12, B5 and B6. Get back on track with our hangover cure. Dehydration and vitamin deficiency trigger the nausea, body aches, and generalized misery associated with hangovers. The After Party IV Drip replenishes and rehydrates your body, restores electrolyte balance, and helps flush out toxins to eliminate hangover symptoms. What’s more, the cocktail’s mixture of C and B vitamins also helps to metabolize the alcohol, increase heart health, prevent liver damage, restore sleep, and balance your mood. The fountain of youth now comes in a drip. Our Anti-Aging Drip is a special formula of vitamin C, biotin, CoQ10 and glutathione that provides whole-body nutritional support to combat the ravages of time. It also works to rejuvenate and hydrate your skin, giving the appearance of lighter, brighter and smoother skin. Beauty is not just skin-deep; it manifests from the inside out. The BNG Aesthetics Skin & Laser Center Beauty Drip improves the look and health of your skin, hair, and nails with a potent combination of vitamin B complex, glutathione, vitamin C, biotin, CoQ10, hyaluronic acid, and L-Lysine. Jump start your weight loss efforts with the Weight Loss Drip, a specially formulated IV which combines three fat burners—methionine, inositol, and choline—with B vitamins, minerals, and carnitine to reduce body fat and build lean muscle mass. The Weight Loss Drip also helps fight your more powerful cravings by boosting your energy metabolism and suppressing your appetite. We are all exposed to numerous environmental toxins—from the food we eat to the air we breathe. Over time, these toxins accumulate in your body tissues, undermining your health and setting the stage for chronic disease. The BNG Aesthetics Cleanse Drip supports a detox from these toxins or a dietary cleanse by combining nutrients, B vitamins, electrolytes, and amino acids. Exposure to toxic metals, such as lead, mercury, arsenic, or aluminum, can severely impact your central nervous, immune, and cardiovascular systems, and damage vital organs. Chelation therapy combines EDTA, DMSA, and DMPS to remove these heavy metals. Research also supports the notion that chelation therapy can benefit those with cardiovascular disease. Reducing stress in your life can improve both your mental and physical wellbeing. The Calming Therapy infusion promotes calmness, contentment, and focus by stabilizing the central nervous system and balancing neurotransmitters. It includes a mighty combination of vitamins, minerals, and amino acids. Glutathione is a powerful antioxidant essential for liver detoxification and the neutralization of free radicals from oxidative stress. IV glutathione often used to support individuals with Alzheimer’s or Parkinson’s disease or those with compromised immune systems. It may slow the aging process, enhance energy levels, as well as athletic performance and recovery. Glutathione Push can be combined with the Myers Cocktail, Super Immunity Cocktail or Energy Drip for optimal results. Yes, absolutely! IV therapy has been used safely in hospitals and medical offices for decades. The BNG Aesthetics team is specially-trained in IV infusion administration, and our clinic provides a sterile, safe environment. Am I a good candidate for IV therapy? IV therapy is an ideal solution for both the chronically ill and relatively healthy individuals. The BNG Aesthetics team will help to determine if you are a good candidate for IV therapy. In general, there are people who may need to avoid treatment, including individuals with congestive heart failure, prescribed certain medications, or with conditions that affect kidney or liver function. How often can I receive an infusion? The frequency of IV therapy is dependent on your current health, your goals for treatment, and other therapies which you employ to optimize your wellness. IV therapy can be used in acute situations or can be enveloped into a larger strategy and conducted 1-2 times per week. Depending on the IV infusion selected, treatment can last 30 to 90 minutes. 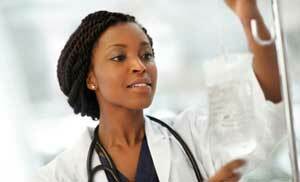 IV therapy should only be performed by a trained medical professional who has extensive experience. Dr. Gabinskiy and his team can help you select the IV most appropriate for your needs and employ tactics which minimize your discomfort and optimize your results.